With the addition of tofu, this potato salad can be a flavorful dish during summer months, but is welcome any time of year. Simple though it is, it’s always a hit with guests, and is a good potluck dish. Photos by Evan Atlas. Adapted from The Vegetarian Family Cookbook. 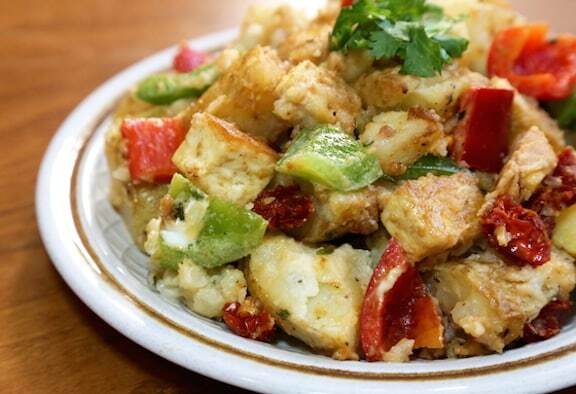 With the addition of tofu, this potato salad can be a flavorful dish during summer months, but is welcome any time of year. Microwave or bake the potatoes in their skins until done but still firm. Let them cool to room temperature. Slip their skins off when they’ve cooled and cut into ½- to ¾-inch chunks and place in a serving container. Meanwhile, cut the tofu into ½-inch-thick slices. Blot well between clean tea-towels or several layers of paper towel, and cut into ½-inch dice. Heat just enough oil to coat the bottom of a wide skillet. Add the tofu and sauté over medium-high heat, stirring frequently until golden on most sides. 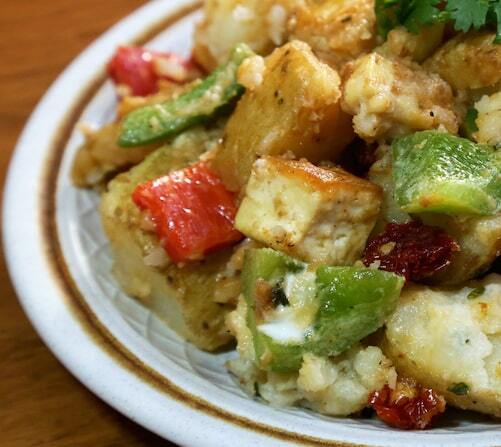 Combine the tofu with the potatoes in the serving container. Add the remaining ingredients and stir together gently. Cover and allow the salad to marinate at room temperature for 30 minutes to an hour. If needed, add a bit more vinaigrette to moisten, then stir again and serve.